Set in the same world as Witch Ember and The Raven, this book tells the story of a murderer known as Sorrow, who is faster and more deadly than any previously known assassin, and who cries black tears while committing crimes. After Sorrow kills the Archbishop Altupater Tuggub while he is staying at the Viscount Palus’ home, a man known as Lord Ash arrives to investigate the crime. He takes an interest in Faina, a fourteen-year-old girl whose status in the household is uncertain. Officially she is a guest, but there are those who say she is more like a hostage, being kept due to conflicts between her family and the Viscount’s. As Lord Ash conducts his investigation, he discovers even more secrets than he expected to find, including a possible plan to revolutionize the Medianist Church. And his quest for the truth about Sorrow becomes intertwined with Faina’s quest for the truth about her life. Even though Sorrow is the third book in this series, it works perfectly as a standalone. None of the characters were present in the two previous books, and while there are references to aspects of the world that will be familiar to fans of the series, they’re easy enough to understand. As in Witch Ember, John Lawson deals with themes like class consciousness and prejudice, the dangers of religious fundamentalism, power and its abuses, the consequences of using people as if they were tools, and growing up and discovering who you are. These themes are handled subtlety but effectively, and the result is a very satisfying murder mystery that is also a sort of coming-of-age story set in a detailed dark fantasy world. The answer to the mystery becomes clear to the reader about midway through the story, but that doesn’t mean there are no more surprises. Quite the opposite, actually—knowing raises more questions and makes things even more interesting. And the ending still surprised me. It was very bittersweet, but in a way it was more satisfying than it would have been if all the characters had gotten what they wanted. I liked Faina a lot. At first she seems sweet but a little naïve, but as the story progresses she grows into a very determined young woman. She’s seen as an embarrassment at best by the Viscount and his wife, but she’s widely loved by what the two would deem unfit company: the Palace’s staff and ordinary people. It was lovely to see how those who surround her help her through some of the most difficult moments of her life. And you can definitely tell why they love her. 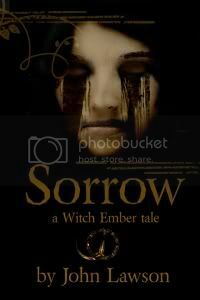 I enjoyed John Lawson’s Witch Ember a lot, but I think I enjoyed Sorrow even more. The plot was tighter, the characters were just as interesting if not more, and the writing was more elegant. Most of all, I liked the fact that even though Sorrow tells a dark and sometimes quite violent story, it also has a very sweet side. Sorrow is now available as an E-book from Drollerie Press. And lo! Chris is giving away a copy. There was a woman in Heroes who cried black tears as she silently killed people with her mind. I am concerned because I really like the picture on the cover. It is dark and menacing. Definitely want to read it. Nymeth, where do you find these unusual books from. Do you read a whole book each day, your so quick! This does sound intriguing. The cover is awesome! Great review. I'm going to have to check this series out. First Chris, now you. What's a girl to do? Your review is spectacular! You made me want to read this so very, very much! So much that I was going to break my book-buying fast. So much that I was going to try to overcome my fear of eBooks. But guess what...I hopped over to Drollerie Press and I just can't find it. I guess they just don't have it up yet? I don't know. Great review. I'm going to have to check this series out. I love this cover art. Nely: It's an irresistible cover, isn't it? I still haven't read the second book in the series, but I've been told it's also excellent. Debi: lol, it's not a conspiracy, I promise :P This one's short, so that makes it easier to read as an e-book. And you're right, it's not up at Drollerie Press yet! I should e-mail them and see what's up with that. Laza: thanks! It's a really enjoyable series. That has got to be one of the scariest book covers out there. The cover is so creepy I don;t think I'd have picked it up in the bookstore but your review has interested. Sounds a great book and I love the cover! Nymeth: Thank you so much for your review! I hope you enjoy THE RAVEN too! Debi: Today is the official "release" day, but due to the time it takes some book vendors to upload the e-books, SORROW might not appear in online book stores until tomorrow. I appreciate your promptness tho! Scrap Girl, Nely, Laza, Bermudaonion: The cover IS amazing. I'll send your props to the artist. I really must read this series someday! Chris and yourself had to have been in tandem on this one. I entered into his drawing to win this book - but even if I don't win - the series sounds really intriguing. Alexa: I like creepy :P The book isn't actually scary, I didn't think...just very dark at times. John, I bet I'll enjoy The Raven. And thanks for explaining about the book not being up yet! The cover artist does indeed deserve some major props. Lena: It's just that we both got ARCs :P But yes, it's a really good series. Good luck with the drawing! I'm with Deb...I think it's a conspiracy!!! I JUST read Chris' review and thought, Oh No...another series I need to read!! Now you??? Of course, the cover kind of freaks me out! This sounds so good! I really need to get hold of Witch Ember too. Thanks, great review Nymeth! The book sounds good but that cover is going to give me nightmares! I really like that this book has both mystery and fantasy elements. You don't find that very often. Great review. Another one to add to the wishlist, you're killing me here! If you haven't already read it, I think you might like Little, Big by John Crowley. It is a really great fantasy/mythological book that I came across last year. Great review and what an awesome cover! Sounds right up my alley! Great review, Nymeth! The cover sure looks scary to me, LOL. Sounds like a very good series so I'll be trying it at some stage. Love the cover! It looks very creepy. 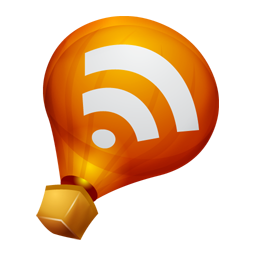 Hey, I just nominated you for a blog award! OK, one more into my wishlist. Book ban... book ban... must. remember. LOL! I concur good ma'am! Seriously, it looks like we had identical thoughts on this one :p Wasn't it great? I'm right with you on this one being my new favorite. I didn't like The Raven as much as Witch Ember, but that by no means means that I didn't like it...it was a great book too. I think you'll really enjoy it! Witch Ember sounds vaguely familiar...hmmm. But, not sure I could read this one without having to tape a giant piece of scrap paper over the front cover. :( Kind of like the illustrations of Coraline, it might keep me up at night! Ha! I LOVE the cover and "who cries black tears while committing crimes". This sounds great and it's good to know it can be read by itself without having read the previous two books in the series. Thanks for the great review. I've never heard of this before and it sounds great! Thanks Nymeth! Although I think I'll start with Witch Ember and read them all! That is so interesting that it is the third book but functions as a standalone. Great idea to bring on new readers. I appreciate it when authors are clever that way. That cover has to be one of the creepiest, in a good way, that I've seen in a long time. Yikes Nymeth! That is one scary looking cover...Great review though! This is one of those books that I would pick up in the store because of the cover. LOL Great review. what a creepy cover! this does sound good. I have both Witch Ember and The Raven in my TBR pile. This series went on my list after I read Chris's review, too. I see I really need to get to these soon! They sound very compelling. Mariel, I think you'd enjoy them both. Dar and Melody, thank you! Jeane, thank you again :D You made my day. Chris: Yes, even if it's not as good as the other too I think I'll enjoy it still. Trish: lol! In both cases I didn't find the images that creepy, but I can see why others do. Joanna: Any of them would be good to start with, really. I hope you enjoy them! Carl: Yes, it works really well as an introduction to the series...especially because the other two are chunksters and this is a quick read. And in a good way indeed! Naida, I hope you enjoy them! Darla: Yep, you do. The world reminds me a bit of Anne Bishop's Black Jewels trilogy world. Not that they're similar, but they share a mood, you know? Ooh, now I really, really need to read them! sometimes i sit and shake my head because I am so amazed at how quickly your read books! Do you ever reread a favorite book?? just wondering ..
sounds very creepy and intriguing- great review! Deslily: I do, but not as much as I used to. I need to make more time to revisit my old favourites..I miss them! Marie, thank you, and I hope you enjoy it if you pick it up. a very satisfying murder mystery that is also a sort of coming-of-age story set in a detailed dark fantasy world. And again, I'm sold. This sounds amazing.